T: Kyoto has a history of over 100 years of films, and Japanese films are taken fairly seriously by people throughout the world. 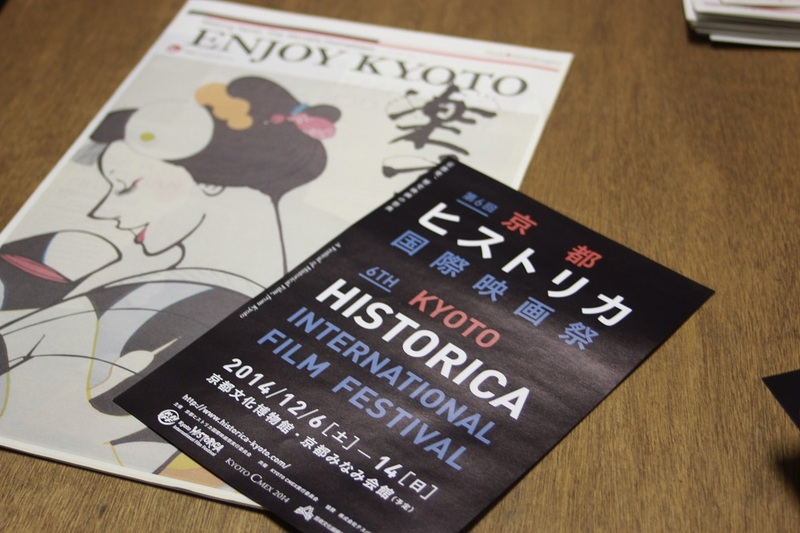 In addition to the Kyoto Historica International Film Festival, we also hold a “Filmmakers Lab”, and young writers from overseas are really delighted to come. M: What exactly is the “Filmmakers Lab”? T: It began when we saw the “Talent Campus” at the 2008 Berlin Film Festival and decided we wanted to do the same kind of thing in Kyoto. M: You mean you took a hint from the Berlin Film Festival program? T: Well, kind of. Actually, the Berlin is number three of the big three film festivals, after Cannes and Venice. The reason it is number three is that the other two are held in tourist resorts. T: So their usual population isn’t even 500,000. Berlin, however, is a city of three million. A film festival held in a big city of three million is inevitably diluted. M: You mean concentration, right? T: Yes. Of course lots of people come, but the concentration is low. Resolving this is one aspect of it. M: It’s also a desire to bring together young talent? T: Of course. Germany’s Foreign Office sponsored the OECD’s Official Development Assistance budget for relatively strategic places such as China, India and Africa. They bring young creators from there to Berlin, Germany, and lodge them together. T: If you invite elite directors and producers to a film festival as guests and have them talk, naturally the young creators will come to listen to them, won’t they? That creates an assembly there, and in that way makes for a concentrated space. T: The creators who come, are for example, someone who is a scriptwriter at a television station in Zambia. A top creator in Zambia. When he makes a documentary in Zambia, he repays the favor by bringing his work to Berlin. It gives birth to this kind of positive cycle. M: So you wondered if there was a way to do that in Kyoto. T: Yes. The Berlin Talent Campus invites about 300 people. So it’s a large number, but that also dilutes it. T: So we decided to do a workshop in Kyoto. It’s called “Hands-on JIDAIGEKI”, and you learn filmmaking from historical filmmaking professionals and experience making one. M: That’s a great endeavor. T: Some of the people that come have also experienced Berlin’s Talent campus, and they say Kyoto is crazy. M: What about it is crazy? T: The fact that the workshop is held in a studio. We hold it with experienced people from Toei and Shochiku who make a proper commitment to the workshop. The workshop uses the actors and sets that the pros use. M: That’s not very common? T: You won’t find it anywhere in the world. T: So when everyone comes here to do it and they stay together in a Kyoto townhouse for a week, they all become friends. M: That would definitely happen. T: They say it’s an unforgettable experience. M: Sharing a common goal of films, and creating them in a wonderful environment. That’s a great experience, isn’t it? T: This year, the film festival is starting on the 6th and finishing on the 14th. The filmmakers lab goes for four days starting the next day, the 15th. Those people are in Japan for about eleven days, and they start their residence here seeing the Historica Film Festival program. As part of that they are involved with the people who come as guests. This is very much an international film festival-like initiative. M: Can we hear the voice of the participants? T: They gather on Historica’s facebook page, sometimes boasting, or announcing that they’re going to be putting out a DVD. Sometimes it’s an announcement that they’re entering a competition. It’s astonishing how high the quality continues to become. M: That’s pleasing, isn’t it? T: Of course, we’re delighted. “I made a feature film”, or “My works’s on Amazon. Please buy it.” There’s more business-like talk being thrown around. They’re growing up strong. M That’s great. That kind of experience might lead them to love Japan and Kyoto. T: I definitely think they will. M: ENJOY KYOTO’s concept is “wanting to live in Kyoto”, and what gave us idea was when we put together interviews with university students who has previously studied overseas, they realized that because of Facebook they were able to pick back up with their friends after they came home. T: Right. It’s amazing, isn’t it? M: Yes. In my day, if you made a friend from overseas, you might exchange letters two or three times. It would peter out and you’d lose the connection. M: In that sense too. T: This guy came to the lab from Macedonia, and now he’s the Macedonian ambassador to Japan! M: What a great success! M: What are your thoughts about the future of the film festival? T: Well, much of Kyoto’s culture is about enjoying history, and period films can be said to be a kind of playing while portraying history, so I think the content of the film festival it really suited to Kyoto. M: Right, until you mentioned it, I’d never thought to put period films and tourism together. T: Right? Because film festivals are originally something that held at resorts like Venice and Cannes. So they’re something you stay the night for. But in Tokyo it’s always business, so inevitably you go to work in the morning and then to the film festival after that. T: You spend the night in Kyoto, and Bertolucci dances in to the breakfast table at some cafe and starts talking about his next film. That is what a film festival is all about. In that kind of concentrated space, holding a market somewhere like Nijo Castle or Honganji Temple, that’s the kind of film festival I want it to become. M: Or being able to eat the food of the countries of the films being shown. People from lots of different countries come and stay, and watch films and eat food and interact with each other. It would be great if it it became that kind of expanded event. T: That would be the ideal, wouldn’t it? M: Thank you for today.